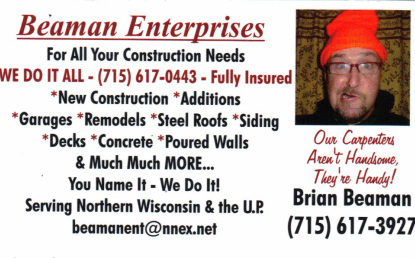 Beaman Enterprises is a General Contractor - Residential / Commercial - Fully Licensed in Wisconsin and Michigan - FREE Estimates. We specialize in: New Construction, Additions, Garages & Remodels, but we don't stop there! Other services include: Custom Finish Work, Steel Roof Systems, Exterior Wood/Vinyl Siding Systems, Windows/Doors - Installation, Custom Decks and MUCH, MUCH, MORE! We offer a fully licensed tree service "Beaman Tree Service", owner Jeff Beaman for all your tree / brush needs. Depending on the season, we offer Lawn & Yard Care/Clean Up, Care Taking, Snow Plowing & Walk Shoveling, Roof Shoveling, Cleaning Services. Serving Northern Wisconsin and the U.P. We offer customer references/testimonials, photo galleries of our past projects. Take a look and see what we have to offer, we look forward to hearing from you.